Android 7.0 Nougat is rolling out for non-Google devices (Pixel and Nexus devices) and Samsung Galaxy S7 has updated! Other devices that have already received the update are Huawei P8 Lite 2017, LG G5, Sony Xperia Z5. 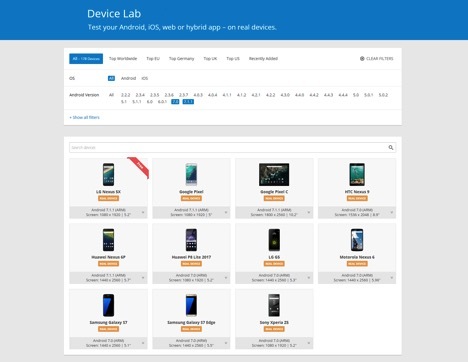 More devices are updated weekly, so keep an eye out on our DeviceLab! Apart from some new features, this update was focused on improving overall security and device performance. So when testing mobile apps, there are a few new things to keep in mind. The new OS includes system behavior changes that aim to improve the battery life of mobile devices. One other goal is also to reduce RAM usage. Your app’s access to system resources and the way the app interacts with other apps will be affected by this update. To improve the security of private files, the private directory of apps targeting Android 7.0 and higher has now restricted access. This setting will prevent leakage of metadata of private files. The Android framework enforced the StrictMode API policy that prohibits exposing file:// URIs outside your app, for apps targeting Android 7.0 and higher. If an intent containing a file URI leaves your app, the app fails with a FileUriExposedException exception. This restriction in Android 7.0 and higher prevents apps from dynamically linking against non-NDK libraries, and that may cause your app to crash. This behavioural change aims to create a consistent experience across different devices. You code might not be linking against private libraries, but a third-party static library in your app might be doing so. Testing on devices running Android 7.0 can assure that your app won’t crash. Learn more about the changes in Android Nougat on Android Developers Platform. As for the other news, we have a lot of new devices in our public cloud! Between the new devices we can find HTC 10, Huawei Honor 7 and new Samsung Galaxy A5 2017, who is also eligible for Android 7.0.We have also welcomed two new Samsung Tablets: Galaxy Tab S2 and Galaxy Tab A. Who's up for some real device testing?